update here is a link http://solutions.terracon.com/arlington/content/Home.aspx to find our where your nearest Arlington TX Brownsfund site is. 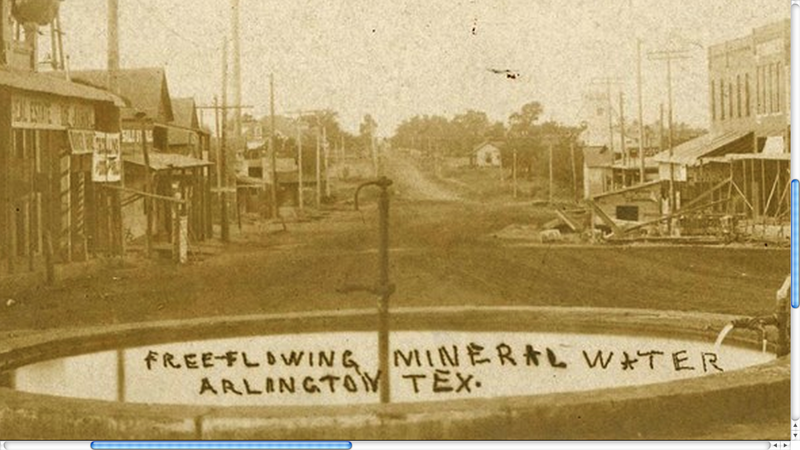 In 1893 a mineral well was drilled at the intersection of Main and Center Street in Arlington TX. The underground well that once flowed the “healing” mineral waters by the old Vandergriff building back in old Arlington’s day can be a risk as a conduit for either the Truman drillsite by the Cowboy Stadium, the other three Division Street drill sites, or the UTA drill site. Reading the State Impact stories below got me thinking about that old Arlington well under the busy street a few blocks away from me…..
At the end of August 2012, Chesapeake fracked 3 wells at the corner of Collins and Division and have yet to flow that back! To make matters worse, on August 7, 2012, City Council approved an ordinance prohibiting the use of and contact with MSD * designated groundwater at the corner of East St and Division St because of ground pollution from an old gasoline station which is only one block away from the Truman/Cowboy Stadium drill site which is at least a few blocks away from this old mineral water well. UPDATE ON 12/4/2012 YET ANOTHER MSD DESIGNATED (page 209) GROUNDWATER USE RESTRICTION-THIS TIME NEAR THE GASWELLS ON GM’S PADSITE…guess what they found in illegal amounts?…..
A R S E N I C AND M T B E …(yes those are known drilling effulents). My PIR with GM shows as of 2009-2011 arsenic and MTBE is not one of their pollutants being reported-however there is an unsettled matter of VOC-unclassified that they exceeded how much they could report in “that” catagory in the last two years”…I have to get an attorney general’s opinion as to if that is a trade secret..”oh come the frack on”. It is very unsettling for my family to be drinking municipal water and for my pipes to be in the ground close to all this contamination. I worry about what fracking is stirring up “down there”. Just the surface equipment used in fracking has been known to crack cement foundations at the Lynn Smith drill site in Arlington. UPDATE>>>>>>as of Dec 2012, we still have no accountability of who or how good they plugged the ole city mineral well. Dear Feil Kim, Your public information you requested:The mineral water well located near the Central Library at 101 W. Abram Street has not been in service since 1984. The water fountain was disconnected at that time and converted to 100% Arlington Water Utilities potable water. No blending of the potable water system and the mineral well occurs currently. Our rules require that all oil and gas wells be properly plugged as per SWR 14. Water wells not associated with oil and gas activities are not under our jurisdiction. The Railroad Commission of Texas does not regulate how close fracing can occur near old wells. There has been an increase in stories ( State Impact story, another State Impact story and the most recent State Impact on the old Butters well story) circulating about old wells being conduits for shallow gas and water geisers made active by new gas well mining and just plain migration over time. Here is one of my favorites…. http://theadvocate.com/home/4074852-125/gas-trapped-near-sinkhole…..”The blast, on Jan. 17, 2001, stemmed from an old uncapped brine well forgotten inside the downtown store that once was part of a turn-of-the-20th century spa. Seven miles away, propane had escaped, unknown, through a failed well casing tied to the Yaggy field salt storage cavern belonging to Oneok Inc., of Tulsa, Okla. The propane moved through the underground Milan Limestone formation, which tilted upward from the cavern toward Hutchinson, a city of almost 41,000 then, until the gas found the old well. An overhead furnace in the party store provided the ignition source, Forbes said. The explosion set fire to neighboring Woody’s Furniture Store, also part of the old spa. You can also read the 1985 Fairfax story and imagine that happening in Arlington…by the Cowboys Stadium downtown. *What is a Municipal Setting Designation? Pantego TX gettn’ in on that MSD action too on agenda items 6 & 7 …..look at page 2 !! This entry was posted in Uncategorized and tagged 1985, abram, artesian, Barnett, Bennett, boom, capehart, cavern, center, chain, cityofarlington, cluck, conduit, Conservation, contamination, corridor, council, cowboy, cracks, dallas, division, dome, drilling, explosion, fairfax, feil, fires, fountain, galespie, gas, geiser, hutchinson, Kim, kimfeilgood, main, methane, migration, mineral, natural, open, parker, propane, reaction, records, request, rivera, salt, shale, shepard, stadium, street, terracon, terriorists, trey, UTA, UTArlington, vandergriff, Vision, Waters, well, wilemon, wolff, yelverton. Bookmark the permalink.